An autistic teenager, with a mental age of three, who went missing on Saturday has been found. A major search was launched when Richard Eckton ran off while out walking with carers at Eggesford, Chumleigh at about 1830 BST. Police, dogs, divers and moor Rescue teams were involved in the search for the 17-year-old. 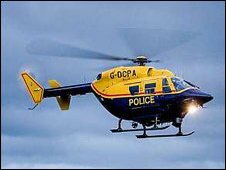 The Devon and Cornwall Police helicopter found the teenager in a field near Eggesford about midday. A police spokesman said the vulnerable teenager was safe and well and had been reunited with his father. Richard had been walking along a footpath which follows the River Taw and the Tarka rail line when he ran away from his carers into nearby woodland. He was found on on a sandbank in the middle of the river after a search of 18 hours.